The Museum of the American Revolution isn't scheduled to open until April 2017, but on Oct. 6 there's an opportunity to learn more about one of the most exciting artifacts the museum will display. George Washington’s Headquarters Tent, which served as Washington’s office and sleeping quarters throughout much of the Revolutionary War, will be discussed during a DesignPhiladelphia event. The tent could be referred to as the first oval office. The Museum of the American Revolution’s vice president of collections, exhibitions, and programming Dr. R. Scott Stephenson; textile conservator Virginia Whelan; and Alex Stadel, a structural engineer from Keast & Hood, will discuss the tent’s history, conservation and the structure designed to support the priceless artifact. Tickets for the event are $10 per person, with proceeds going to the tent’s continued conservation. The actual tent is being stored in a "secret location" outside of Philadelphia until January, a museum representative told PhillyVoice. However, there will be a small model of the tent as well as a multimedia presentation during the panel discussion. 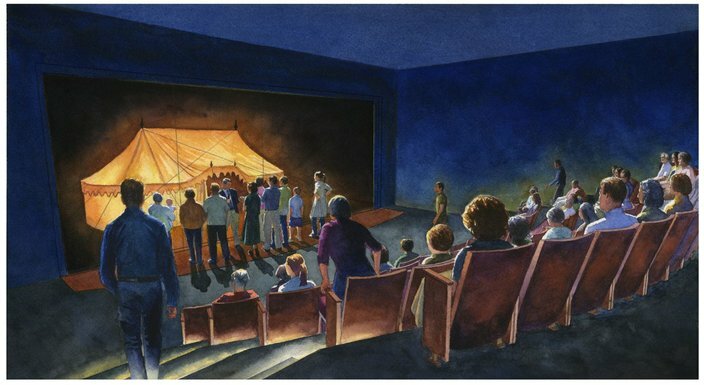 Once the museum opens, the tent will be featured in its own theater, as part of a multimedia presentation exploring Washington’s leadership. Artistic rendering/Museum of the American revolution. A rendering of the exhibit featuring George Washington's tent from the American Revolution.